His first large-scale exhibition-performances were staged in Texas in the 1980s; in 1992 he choreographed a new opera, Orpheus and Eurydike, in Chicago, and throughout the 1990s he created dance-theatre, multimedia and public art projects based on collaborations between performers, musicians, visual artists and cultural workers in the U.S., Eastern Europe and Latin America. His ensemble has toured internationally and presented work at festivals, theatres, schools, cultural centers and conferences on both sides of the Atlantic and on the Internet. He has received numerous arts grants, awards, and fellowships for his work and the concepts for his intercultural productions, including a NEA/Rockefeller artists project grant. His dance/film commission, Parachute, was shown at the 1998 Houston International FotoFest. In 1999 he directed the experimental opera Mirak, featuring Angeles Romero, with whom he also presented fishgarden at the Vogelfrei Festival in Darmstadt. Wiith the Environments Lab he toured Ohio, Michigan, and the Intermediale Festival in Mainz. 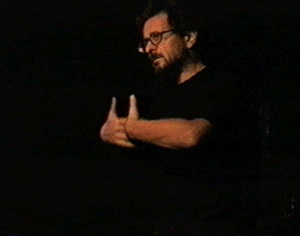 His Vespucci film installation was exhibited in the US, England, and Brazil. Most recently, he directed a new interactive multi-media play, Sueño, written and performed by Angeles Romero. In collaboration with composer Paulo C. Chagas the new intermedia song cycle Canções dos olhos was created in 2005, and for 2007 Chagas and Birringer will create the music film recital Corpo, Carne e Espiríto. Birringer received his M.A. and Ph.D. from Trier University (Germany) after research fellowships at Cambridge and Yale Universities. He has taught performance studies at Yale University, UT-Dallas, Rice University, Northwestern University, and at the Giessen Institute of Applied Theatre Science. He has published widely on the visual and performing arts and is a contributing editor with Performing Arts Journal (New York) and Performance Research (London). His books include Theatre, Theory, Postmodernism (1991), Media and Performance: along the border (1998), and Performance on the Edge: Transformations of Culture (2000). His new book Dance Technologies and Interactive Art will appear in 2006. He also co-edited a new book on Dance and Cognition (2005). After establishing the "Environments" lab at Ohio State, his current work promotes the organic integration of live performance and digital, interactive architectures requiring new processes of composition. Research paths include: interactive performance systems and digital interface design, telepresence and distributed performance, motion capture and videodance. In 2003 he founded the Interaktionslabor Göttelborn in an abandoned coal mine in Germany, and his summer workshops there are linked to the independent research group at the DAP Lab and his continuing involvement in telematics and collaborative online composition (ADaPT), involving multiple partners in the US, Europe, Brasil, and Japan.